If anyone lived at this orphanage and would like to discuss it with someone else who lived there, please contact Mary. Attached to St. Peter's Church, located at 44 Belmont AVenue. 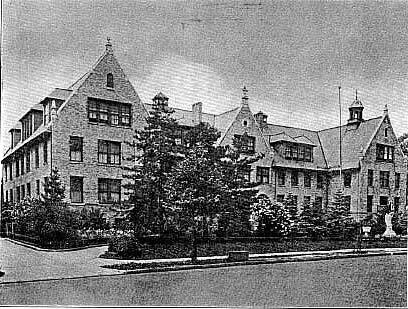 A Catholic institution for the care of destitute orphan or half-orphan children of both sexes. Children are admitted between the ages of three years and twelve years. The length of time children are kept depends entirely on the circumstances of the individual cases. Capacity, 200. The visiting days are Sunday afternoons. Children are sent to the Parochial School. Manual or industrial training is given to the children of the Asylum. There is no fixed charge. The highest amount ever taken for board has not been beyond $10.00 per month. Care and schooling of children in charge of fifteen school Sisters of Notre Dame. Admission to the Asylum is by application to the Sister in Charge, Sister Mary Severine.